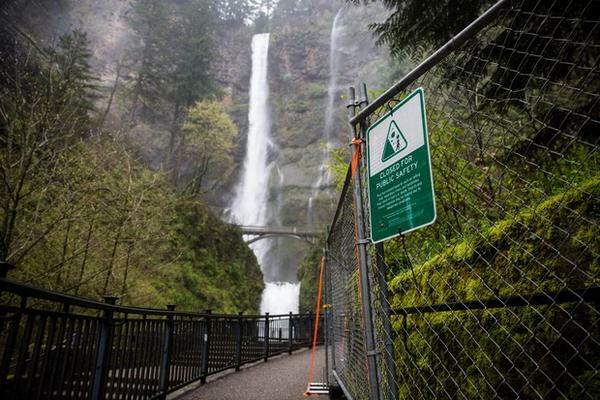 "Closed" signs mark off parts of Multnomah Falls, April 13, 2018. "We knew that there were some potential unstable rocks in the area, so we sent some Forest Service geologists in to have a look," said Rachel Pawlitz, public affairs officer for the Columbia River Gorge National Scenic Area. "What we learned is that there’s an overhanging rock that is unstable." "So there is a solution for it. We can have a contractor come in and do rock scaling, which is where they intentionally cause it to fracture and fall in a somewhat controlled way so that it’s no longer hanging there leaving us with uncertainty about it," she said.